Although often a mysterious vegetable in many parts of the world, the drumstick is a common ingredient grown all over Asia and Africa. When I go back to India, it is a common sight in many of my neighbours’ back yards. The tree is valued mainly for its tender pods – “Muringa kai” in malayalam. It is known as a ‘drumstick’ in English, or Moringa oleifera in botanical terms. The pods are greenish and firm on the outside, but on the inside are filled with a white colored, mildly sweet flesh and small white seeds. When you buy the pods, look for smooth, greenish, slender pods and avoid matured ones. The only portion consumed is the soft white interior, in which the seeds are embedded. 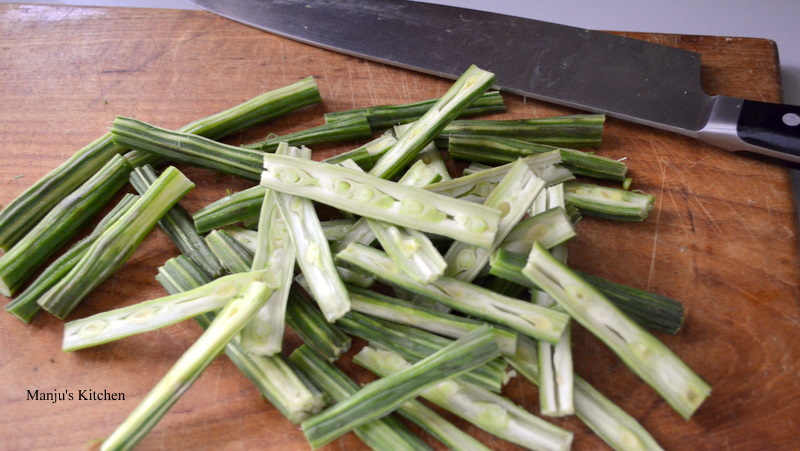 The drum sticks are lightly peeled and cut into finger lengths before cooking. These long slender pods are a foreign and tricky concept for those who have not been brought up eating them. At a formal meal, the drumstick pieces are split open with a knife and fork, and a spoon is used to scrape out the flesh. During casual family meals in South India, where we eat with our hands, we pick up the slit drumsticks with our fingers and scrape away the soft cooked centre with our teeth, and the outer skin is thrown away. They are a popular ingredient in vegetable curries in South India especially for sambar (lentil and vegetable stew). It adds a very distinctive flavour to the curries when stewed together with other ingredients. Muringa kai thoran is a recipe in which muringa kai or the drumstick plays the central role. 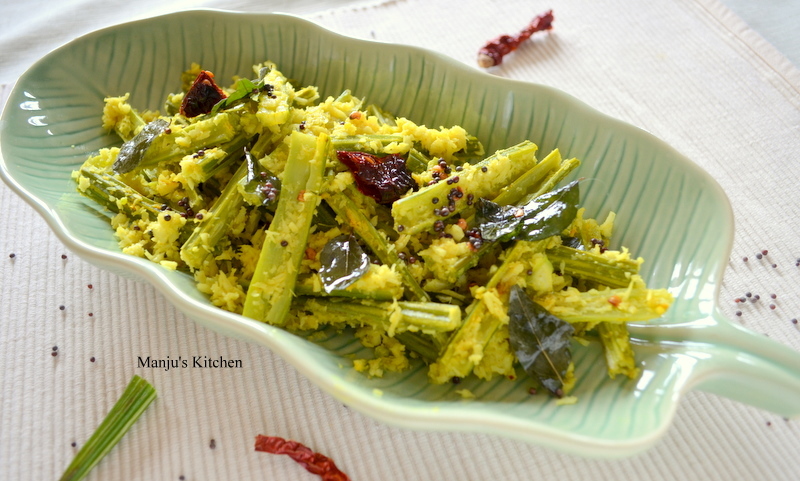 It is a traditional keralan style thoran or stir–fry, with coconut and mild spices. I have adapted and simplified the traditional recipe slightly to suit modern kitchens. I like to cut the drumstick pieces in half for this dish rather than scraping out the flesh and cooking it. The skin adds a wonderful texture and appearance to the finished dish. Peel the muringa kai (drumsticks) lightly and cut into 4-5 cm pieces, then half them lenthwise and keep aside. Heat oil in a frying pan and fry mustard seeds until they pops , add dry chilli and curry leaves, fry until the chilli turns light brown. Add the drumstick pieces, grated coconut, turmeric powder, cumin powder and salt. Mix well and add two tablespoons of water, cover and cook in slow fire for 8-10 minutes until the flesh is tender.